LIFESTYLE: #MoneySavingTips Ways you can save! Since putting up my post the other day on "October no spending" I was very surprised to see lots of interest on twitter from other bloggers asking how I am doing it. 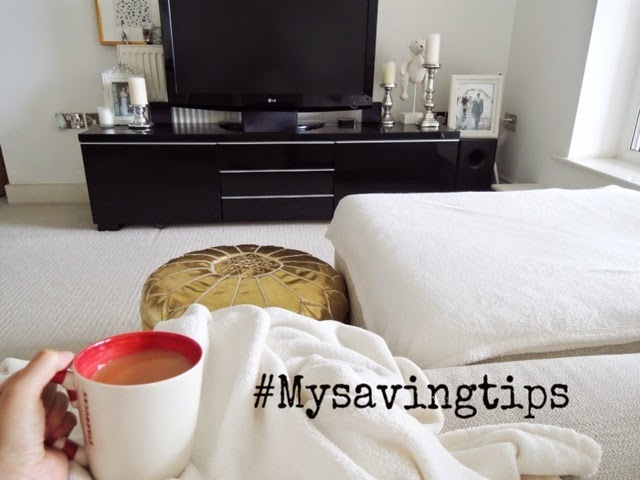 So sit back with a cuppa, note pad and get scribbling on ways you can save! I have put together things that are helping me which you guys may find helpful. When looking through my bank statement online majority if not all my outgoings are for food or clothes / online shopping. Based on that my savings have been focused around these things. Firstly we all have to eat and quite often cutting out things out take away food, Starbucks, buying from the Tesco express etc and begin with meal planning is a great start. Both of us work full time so when we get home from work we both don't want to cook (yes very lazy) and we either get take out or eat what ever we have in the cupboards. Before I went away on holiday I subscribed to HelloFresh with my £20 coupon (you can get £20 off your first order with this code: Y9A96M) and we have been using it for the last few weeks. I will do another post on this later on but we are paying £49 a week for 5 meals for 2 people this is less than what we spend on our weekly shop and the food is so delicious and easy to cook. I don't know about you but I am signed onto loads and loads of email subscriptions offering various discounts and deals. These marketing emails are very clever at sending them at certain times where you will have time to browse eg: straight after pay day / leading up to pay day / lunch breaks / weekends etc... I have either un-subscribe or just deleted them straight away without looking. When you start browsing the temptation kicks in and inside your head you will be thinking of reasons to justify the purchase. I am sure majority if not most of you reading are bloggers so this generally takes up a lot of your time. Try and spend weekend doing things that are free so you are out and about getting inspiration and taking photos for your posts. Winter is approaching so I know some of you will like to snuggle up at home catching up on reading blogs and watching youtube. Quite often I like to buy new things to try and soon as I open something new the old product seems to get forgotten. Put together in a basket of all your opened products and use them up first before opening / buying anything new. I tend to stock up on offers eg: 3 for 2 shower gel so make a list of unopened products so before you repurchase check you don't already have a spare in the draws. If you find yourself needing to top up on a few items or you need to go out to celebrate friends birthdays etc...always do searches online for discount codes / deals (never pay full price unless you have to) eg: pizza express coupon just go on google and search "pizza express discount october 2014" and a list of deals will pop up and this actually works for anything you want to buy online and I do this all the time. Here are some websites I have found useful in the past. I hope this has given you a few ideas on how you might be able to save! Haha I am sure you will have your own tips to share with me! I love using coupons! You pay one dollar for the newspaper and get a bunch of money back... I think that is amazing. I used to be an extreme couponer, but I saved on a bunch of junk food so I stopped. But couponing is great for household and beauty stuff for sure! I don't think we have as many coupons as u guys. I've watched the extreme coupon US shows and they are crazy! It's like a fun game for them....think we are slowly getting the bug over here! These tips are really useful, some seem pretty simple too and I've never even considered them. I'm going to take a leaf out of your book this month:) Thankyou for sharing your tips. Your welcome! I hope some of the things I've mentioned can help you! Definitely need to follow these tips! I hope this helps u!!!! Good luck! Thanks for sharing your tip with us all! Yes I love coupons!!! I will share more tips with you guys leading up to Christmas! I have always had trouble with meal planning and wastage so this works well for both of us and actually works out cheaper. We always buy fresh and it is expensive!